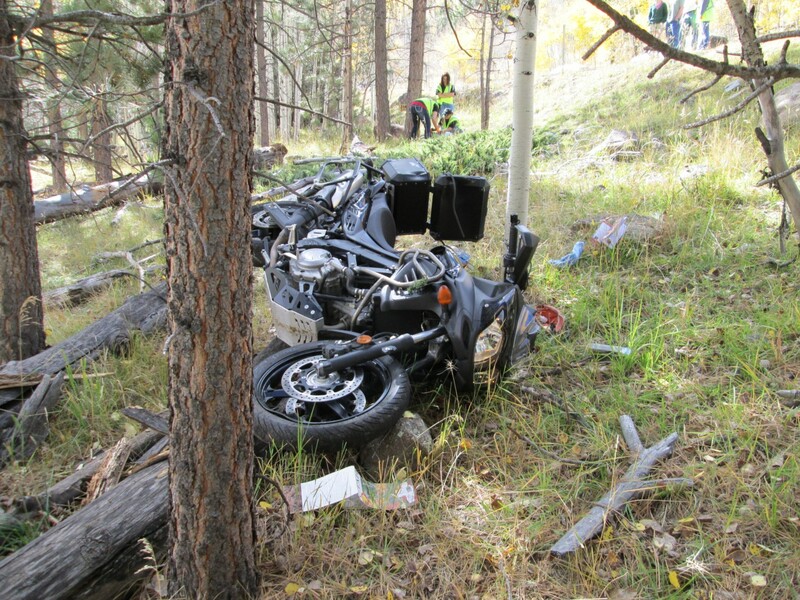 BOULDER — Utah Highway Patrol has released the name of a Colorado man who, motorcycling on state Route 12 Saturday, died upon colliding with a tree that was falling as a result of two Boy Scouts cutting it down. Edgar E. Riecke, 69, of Durango, Colorado, died when he was struck by a falling Aspen tree while riding his motorcycle north on state Route 12 about halfway between Boulder and Torrey, UHP spokesman Joe Dougherty said. The tree had been felled – that is, cut down – by two Boy Scouts who had stepped away from their group, Dougherty said. The Boy Scouts were in the area with a permit for cutting down trees for firewood, according to a statement issued by Dougherty on Saturday. “The tree fell right in the split second that the man was passing on his motorcycle,” Dougherty said. Riecke collided with the falling tree head-on and the tree broke the windshield of the motorcycle, the UHP spokesman said Sunday. A group of eight Boy Scouts and two Boy Scout leaders saw a full view of the occurrence, Dougherty said. Witnesses reported seeing the man’s body go limp and fall off the motorcycle upon impact with the tree, he said, and the bike then careened off the road into a stand of trees. The motorcyclist was wearing a helmet, according to UHP. In a statement issued by Dougherty for the UHP on Saturday, he said it appears to investigators that this was a case of unfortunate timing. According to all available reports, yesterday’s events were a tragic accident. In Scouting we strive to make every effort to provide a safe environment for all that are involved, both Scouts, leaders, and the public. As a council, our hearts go out to the family of the person who tragically lost his life in this terrible accident. We express our sincerest condolences to his family and friends. We are also mindful of the Scouts, leaders, and families of this troop at this time and the impact yesterday’s events had on them. As a Scouting community we invite everyone to remember all who were involved in their thoughts and prayers. As far as legal issues are concerned, whether the Boy Scouts were too close to the road or whether they needed to set up cones or flares as warning devices for passing motorists or take other measures, that will be determined by the Garfield County Attorney, Dougherty said early Sunday. Later on Sunday, Dougherty said again that it does not appear that any criminal action took place, but the Garfield County Attorney will make such determination. UPDATED 8:18 p.m. to include Endicott statement as reported by Fox 13. Why in the world were they negligent in closing the road while they were harvesting trees close enough to the road for there to be ANY possibility of something like this happening? Prayers to the family of both the victim and the Boy Scouts involved in this terrible tragedy. They forgot their own motto. ALWAYS BE PREPARED. It was a temporary lapse in judgement. Lets get these boys a FUNDRAISER right away! How about a FUNDRAISER for the mans family that was killed over their ‘temporary lapse in judgement’. The scout leader who was in charge of these boys needs to be held accountable for negligence. It’s just plain stupidity to be cutting down trees next to a highway. In this area, the victims do no get justice. Cook your baby in a car, and you get a fundraiser. These scouts were negligent and it resulted in a death. Too bad the atty general has no balls to pursue charges. Unfortunate timing? No, more like absolute stupidity. Who fells trees where they can fall into a public road without erecting any kind of warning barrier? This wasn’t purely an accident. It was negligent homicide. FUNDRAISER for the boys and the scout leaders! Imagine what they are going through! I have read both stories and the accounts from the Boy Scouts do not add up to sound decision making. They were cutting down a tree for fire wood with a permit yet I see all kinds of dead trees laying on the ground in the pictures that were taken. The tree that was cut was close enough to the road that if it fell the wrong direction it would impact the travel lanes. So this sounds like more of an exercise on how to cut down a tree than it does of just collecting fire wood. I don’t know why the Scouts did not go deeper into the woods to perform their fire wood collection but this decision will impact many lives from that day forward. Just because is was the Boy Scouts does not mean that they should be held any less accountable. These leaders should be charged with negligent homicide because their actions caused the death of another person. They are leaders and they should know better. That’s why they are there, to lead. They were cutting the trees that close to the highway ? And apparently clueless about the direction of the fall ? Time to STOP their cutting permits until the leadership has proven they have sufficient training in how NOT to kill someone while doing it . Remember, these are not BSA leaders, they are LDS members “called” to perform church activities with their boy-aged members (and a “called” member would never say no, in fear of looking bad). A REAL trained BSA leader would never allow that to happen on their watch. Remember the LDS leaders toppling over geological formations?? Can’t wait to see the lawsuit that will and should be brought upon these “leaders,” their church and the BSA. The BSA should forbid the LDS church to use their Scouting program as the LDS boys program. Mormon church, come up with your own program! I guess the question we need to ask here is: should we punish stupidity as a crime or forgive and forget w/ no repercussions? Keeping it classy as usual, Mormon haters. How about a little respect for the deceased? He and his family don’t need you ghouls picking him over just so you can get your hate fix. “ghouls” have you seen our local bookings page? Halloween is year round here. Or you could say most of the cast of The Walking Dead, spend a lot of time here in the STG. “felled” I noticed this word on Fox News. So I looked it up. Its a word! Its like “hanged” when used in a certain context. I also noticed KUTV said “chopped-down.” being that they used an ax the tree would have been cut down…right? It did not “felled” Fox News are a bunch of morons. I watch it every Saturday and Sunday to watch the impending train wreck between Kelly Chapman and that Scott dude. So when they used the word “felled” it did not surprise me. Saint George News surprised me in the use of such Utonian grammar. GO FALCONS! Omg. Sue happy people. Sueing people does not solve anything. Can you say stupid and irresponsible. Let’s drop some trees on the busy highway. Kill someone? Not a problem if it’s a church sponsored activity. We’ll just rush out and proxy baptize him on the spot. Make him one of us. Wow. So much love and tolerance here. Maybe we should be real hypocritical and spout off how much we love the gays but then turn and hate the Mormons. I have no doubt, that each comment here is written by an ex-Mormon. Well I’m taking Utah off my vacation list, I’m afraid I just don’t have the timing to avoid the trees that Utah folks are allowed to drop on highways. I won’t play tree roulette with my and my children’s lives.